Tropical Expat is having somewhat of a hiatus. It is actually quite time-consuming writing a blog, and at present I am spending a bit more time on my German study, but also I only want to write when I have something to say – normally something positive that people can actually use. Also, I am quite distressed – but not fearful – by the Malaysian Airline incidents this year, and now by the media hyping the Ebola outbreak. So, despite the fact I have over 40 partly written blogs waiting in the wings (no pun intended – my imagination just took flight [oops]), now I am not in the mood to finish any of them at the moment, and have been also spending a lot of time reading what I can about the Malaysian Airlines flights, and Ebola. Both of these matters have put me off any travel until I can get a handle on them and have a strategy, or until the situation stabilises. 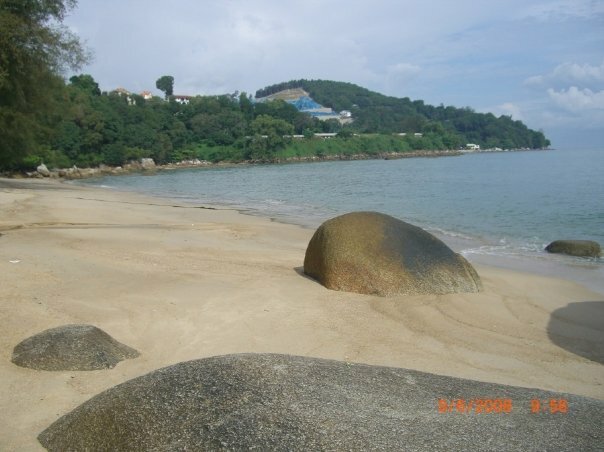 And travel is one of the topics I blog about – or presently am not as I am not travelling. About the MAS flights I haven’t much useful to say. There are many anomalies in the stories , and I have read a lot of web sites, and many theories, but don’t have access to hard facts. I have been trying to form an opinion as to whether MAS is being targeted, and thus whether it is safe to continue to fly with them. MH17 was almost immediately used by western governments for political purposes – to blame Russia and promote sanctions and possible war – way before any evidence of anything was available. This is one of the hallmarks of a false flag operation, and there are others. I think MAS probably has been targeted, but if a third incident occurs it becomes too obvious, and thus hopefully won’t happen. Christine Lagarde, IMF head, spent a little time talking about numerology and relevance of the number “7” this year in a January 15th speech – and many of the incidents and crashes do have a lot of 7’s associated with them. Just raw 7’s – no adding up or multiplying or anything complicated. Just check the dates and flight numbers, passenger numbers and even times of air crashes and incidents this year. And, of course, it is weird that the IMF head was talking about such esoteric matters. So, where I am heading with this is that I would probably prefer to catch another airline other than MAS for international flights – Air Asia etc. if in the region. But I would also avoid any flight numbers or dates with a 7 in them. I certainly do not wish MAS any harm, and hope the truth is revealed to us and I can fly with them again. I read that Ebola is very contagious, can be transmitted by aerosol, can survive for days outside of a host, has an incubation period of over a week, and has a death rate of 90%. One person on a plane sneezing could lead to many people catching it and then spreading it unknowingly all around the world. “At the epicentre of the current Ebola epidemic is the Kenema Government Hospital in Sierra Leone, which houses a US a biosecurity level 2 bioweapons research lab with links to the Bill and Melinda Gates Foundation and Soros Foundation.” says Rumor Mills, and and journalist Jane Burgermeister who writes about such matters, among others. I have read elsewhere that people in Africa suspect the western doctors from, among others, Médecins Sans Frontières of spreading Ebola through vaccines etc. and keep away or run from them. So, where I am heading with this is, I am going to avoid any medical prophilaxis and prevention methods, and again minimise plane travel. Oh, and wash my hands more frequently than ever. I have been badly hurt by vaccines before, and avoid them at all costs, and they have had far worse effects on a friend of mine, who barely survived a vaccination for flu. I read that the cures for Ebola are colloidal silver or food grade peroxide, or possibly Vitamin C. I want to look into the protocols for usage of them as I haven’t yet found any. Now if you don’t believe in conspiracies – two or more people plotting in secret to do something usually bad – then I think you are naive, but I don’t want to argue about it. I am just trying to present my opinion of some practical approaches. Which is what this blog is for, anyway. Until about 100 years ago, colloidal silver was commonly used by the medical establishment. To read a little on colloidal silver see here and here and here. Colloidal silver is a natural anti-biotic, and after I used it my lungs cleared out some stuff, so it felt effective. I bought an Omron nebuliser in Gurney Plaza, in a shop near Cold Storage. I use the gel to take the itch out of mosquito bites, and for any burns. We wipe the interior of jars with CS just before adding yoghurt or sauerkraut. It makes better, thicker yoghurt and the sauerkraut lasts longer. 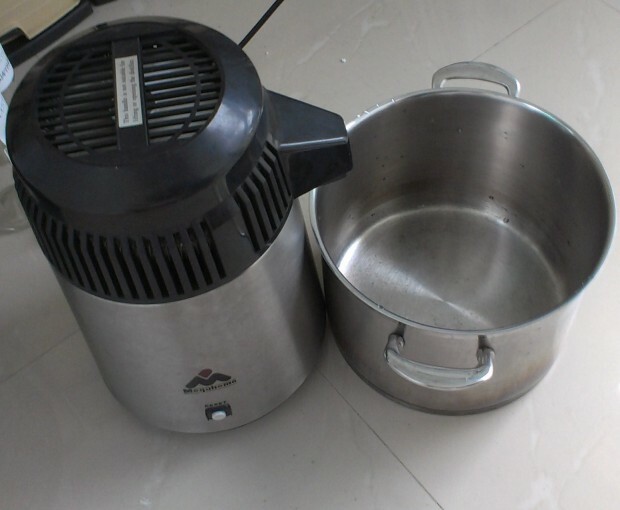 You can make colloidal silver at home if you have the right equipment. Basically, you need distilled water and a colloidal silver maker. I bought mine from Silver Well by Internet order. It is also convenient to have a TDS (Total Dissolved solids) meter, and a laser light. It really is easier just to order them all together from Silver Well. And buy the gel kit too, as CS gel is very useful. I have ordered from them about three times and found this company trustworthy, and the product good. But there are other companies you can find on the Internet, too, if you wish. Silver Well also tell you on their site how to make your own generator by yourself. The instructions they provide are good too, and go into far more details than I do here. 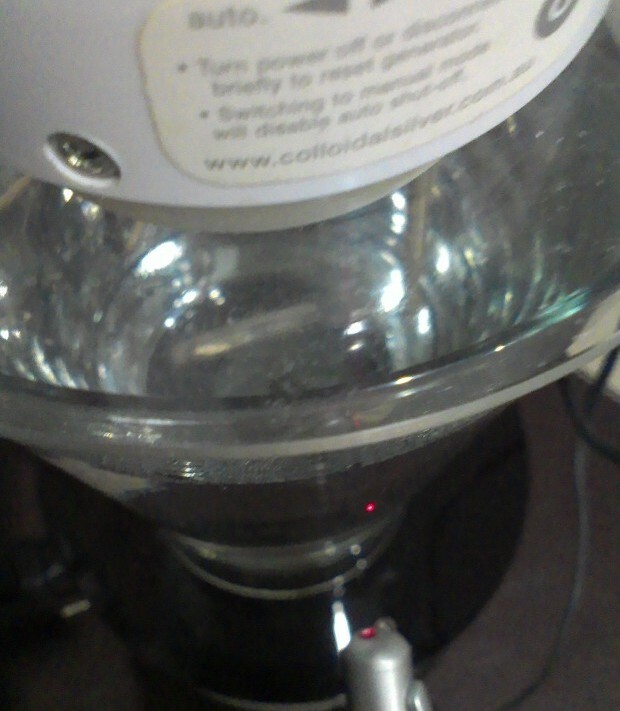 Anyway, here’s what to do… Get distilled water. 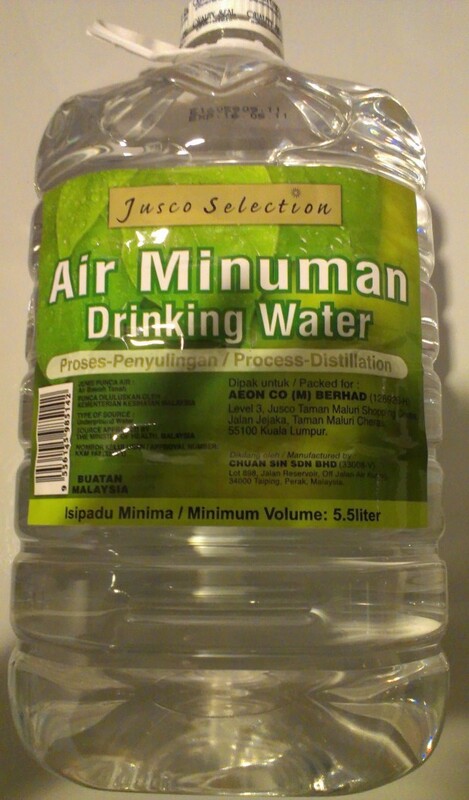 You can buy distilled water from Jusco, and I have seen the Spritzer brand in Tesco. Just double check it clearly says it is distilled. However, like the Jusco bottle below, the bottle will be a PET bottle, so BPA will leech into the water, making it unhealthy. 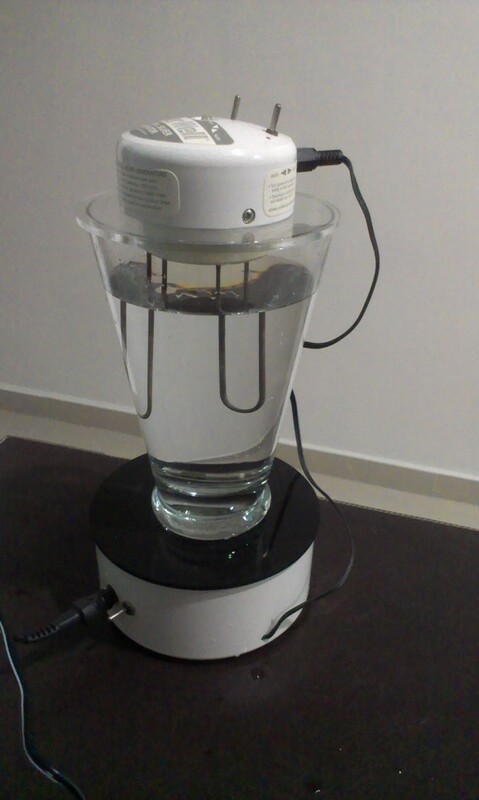 So I prefer to make my own, using a water distiller I bought in the UK, but is made in Taiwan. I note this model has been revamped since I bought it a few years ago. Mine is still going strong. 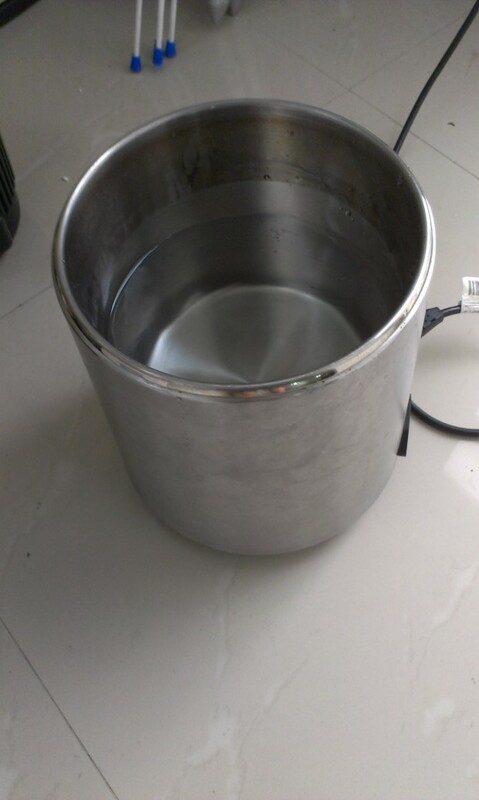 Assemble distiller and run for several hours – the water will collect in the open pot. I am going to make the CS in the glass below, so first I pour in distilled water to near the top. 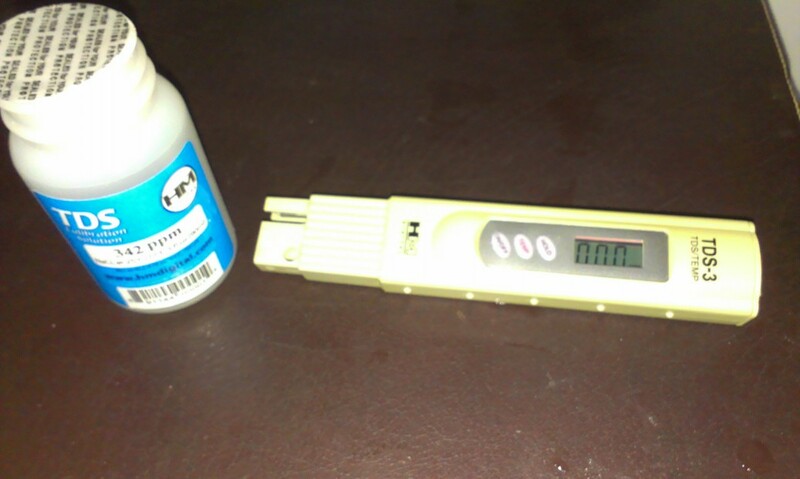 Then I test it with a TDS meter. It is important that the reading is 3 parts per million or less. I expect it will be zero, as indeed it is. You are wasting your time if you use impure water – tap water, rain water, mineral water etc. can be from 10ppm to hundreds of parts per million. TDS reading is zero for the recently made distilled water. 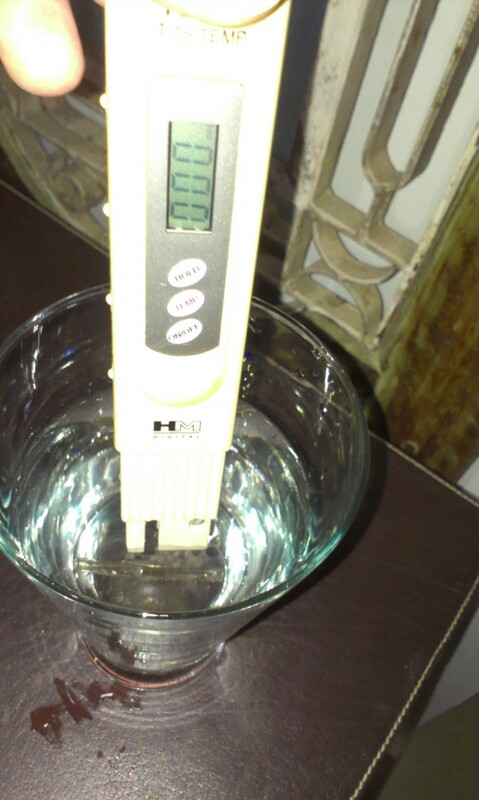 Occasionally it is a good idea to callibrate the TDS meter. For this you have a solution of 342 ppm, and you adjust your meter so it reads this when testing this solution. Then just connect up the CS maker, and let it run for a few hours, until the green light goes off. The TDS meter will not give an accurate reading of the amount of silver in solution – it’s about twice or three times what the meter reads if you use it. Instead, to check it is ok, shine a laser light through the solution, and if there is a strong beam through it, you have made a good batch. Basically, it’s foolproof if you just follow instructions, anyway. That’s it, really. Store in a dark glass bottle – old red wine bottles with screw caps are good – and store in a darkish place. Tropical Expat has been laid low for almost a month with some sort of flu, caught possibly while travelling on the trains in Malaysia. As usual I waited for it to go away, with no treatment, but it didn’t. The fever did, but occasionally came back for a few hours after a few days. This blog is about how I treated it, and recovered. As an aside, I have thus been unable to research material for writing blogs, as I have been at home except for grocery shopping, and cancelled all social engagements and outings. Around 4th October I had a headache, light fever, and coughing, but I “recovered” the next day, only to have it return with a vengeance about three days later. A few days later I “recovered” again, and then it soon returned, and stayed, so by Thursday 11th October the coughing was quite bad. I still expected to recover naturally, so did no treatment. The following Thursday 18th I was coughing so badly that the coughing caused back damage, and from then on any coughing was painful. As a result on Monday 22nd I finally went to the hospital, as described in an earlier blog of mine. The general idea from both doctors I saw was to treat and cure the cough, and thus the cause of continual back pain will be removed and the back will be able to recover. 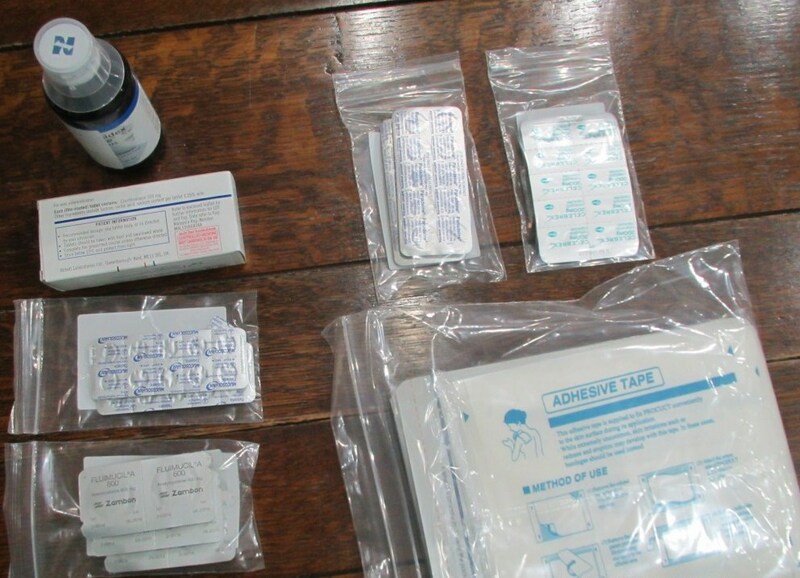 I was prescribed these medicines (on the left side) for the cough. I took the medicines as prescribed, and a week later I was feeling a little better. But from then I was on my own, as I didn’t see much point returning to the doctor, and didn’t notice any dramatic results from the medicines. fasting or light eating – mainly fruit. This meant my body spent less energy on digestion, and more on healing. As I was using little energy staying at home, I hardly needed much food. 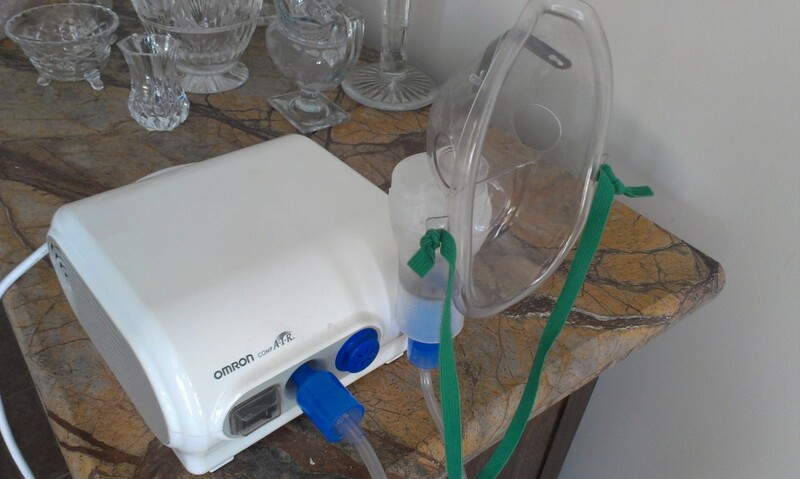 using the nebuliser with colloidal silver several times a day. I couldn’t inhale deeply as this caused coughing fits, which caused my back much pain, but gradually as my lungs cleared up I could inhale more deeply, which would make it more effective, too. For more on colloidal silver see here and here and here. Colloidal silver is a natural anti-biotic, and after I used it my lungs cleared out some stuff, so it felt effective. I bought the Omron nebuliser in Gurney Plaza, in a shop near Cold Storage. Oil pulling – which removes toxins from your mouth, and thus your body, so gives your immune system more chance to heal you. I use coconut oil, and generally did it once a day until I was recovering well, when I increased the frequency to twice or three times a day. Reiki. Being a Reiki master myself, naturally I did this on myself. Ginko nuts – bought at Pulau Tikus market – are good for coughs. Persimmon – bought at Pulau Tikus market – are also good for coughs. I tried to sleep when possible, but it was painful for me to lie down, so unfortunately I couldn’t sleep well or as much as I wanted. Coughing was least painful when I sat down in an average height solid chair. Lying down or standing up, or sitting on a soft sofa or a mattress was much more painful, thus causing more damage to my back. I had to rush to a chair when I was about to cough. So in the five days since I finished the medicines and used the above treatments on myself I have experienced a strong recovery, with my lungs clearing out, and being able to inhale much more deeply. Living in the tropics unfortunately means year round mosquitoes. Of course, the main danger with mosquitoes is that they are a vector (I’ve always wanted to use that word) for malaria and dengue fever. If a mosquito of a certain type bites someone who has either of these they will become a carrier. Then if they bite someone else the person bitten may contract the disease. Most carriers are apparently illegal immigrants who brought it with them to Malaysia – it’s actually quite unlikely you will stay or go to the same places as them. A possible exception is construction workers building a condo near where you are. Nevetheless, mosquitoes do not travel very far. Buy a mosquito attracting device – a UV light and fan that attracts them and then traps them. If you suspect none of the above will be sufficient, use an insect repellant wipe – much more effective than a spray. And if this is still not enough you can buy an electric mosquito killing racquet. It’s rechargeable and much better than using a spray if you can see the mosquito. Mosquito netting for your bed would work, but is overkill for Penang. And, inevitably, you will get bitten. I apply a collodial silver gel, which I make myself – in a few minutes the itchiness is gone, and a little later so is the lump from the bite. I will cover colloidal silver in a future blog, but you can google it. It is very unlikely that an expat will contract either of these diseases, but I always keep MMS on hand in case I contract either dengue or malaria. MMS will be the topic of a future blog, too, but you can see http://www.master-mineral.org. Malaysia is experimenting with genetically modified mosquitoes to make it difficult for disease carrying mosquitoes to breed – so far all genetic modification has been a disaster with food. Doing it with mosquitoes in the wild is scary to me. Unsurprisingly, there are male and female mosquitoes. Males are vegetarians all their lives and will not bite you. Females will only bite you at the end of their life cycle to lay eggs, because they need extra protein, and will bite on average four times to get the nutrition they need – this last figure being contentious. Females’ probiscus is much bigger than the males’ – that is how you can tell them apart – at least after you have killed them. They like blood type O best. So, sleep tight, and don’t let the mosquitoes bite.